Why Ironman? | Ironman for Life! Ever since I started participating in triathlons in1981 I wanted to do an “Ironman.” Now 125 triathlon races later, including 12 Ironman (2.4 mile swim, 112 mile bile, 26.2 mile run) finishes, I believe I am getting closer to the reason “why?” Of course, at first there was the typical “why do you climb a mountain….because it is there” attitude. Or, “Let’s just see how tough I really am……” However once we allow ourselves to move beyond that primal thinking deeper and more fulfilling exploration takes place. Over the years I have evolved to now believe that there are at least 3 main reasons for such events/participation. These include: 1) displays of unconditional love that are many times missing (or ignored) from our modern world, 2) personal internal exploration into areas not typically revealed or evaluated in everyday life, and 3) the spiritual pureness and simplicity of the wonders of nature. Having just returned from Ironman Canada, my best memory is not a successful completion of the course, but rather the very striking displays of unconditional love that escorted us all through the day. Although the race is on Sunday, I always “start” on Saturday evening by finding a local church. The Saturday evening Mass at Penticton’s Catholic Church filled the bill. Love to all visitors, mostly triathletes, radiated throughout the service, including the Priest’s message which used the Ironman event as metaphor for community, support, and love. The small town of Penticton, British Columbia was celebrating its 20th anniversary of staging this Ironman event, the second oldest and largest on the world Ironman circuit. Each year more than 4000 volunteers turn out, many of whom have volunteered for a large number of those 20 years. Why? Sure they get a T-shirt and have some fun, but for 20 years! My only explanation is love for fellow human beings and that the “Ironman” is simply an organized avenue of expression. As the Priest asked, “What would the competitors do without volunteers, and what would the volunteers do without competitors?” This is “community,” “support,” and “unconditional love” exchanged between strangers who have never met and may never see one another again. This display gives a renewed confidence in the goodness of humankind, and the most awesome power of love. What a joy and gift this is to experience! Most of us have fears that keep us from fully exploring our inner selves. We usually do not fear our limitations – those are known. Rather we fear exploring our furthest abilities – those are unknown. When we take ourselves to our limits, whether it be academics, spirituality, social, parental, and spousal relationships, etc, or in athletics, we are at the same time exposing ourselves to failure, and yet we don’t feel “complete” until we have explored that unknown area. When we do explore, we then develop a peace or calmness that comes from truly knowing who we are, and what we are capable of achieving. When we are tired, hot, hungry, thirsty, scared, and sore and the devil taps us on the shoulder to say it is ok to stop/walk/quit, what do we do and how do we respond? We can either give in and fail to discover our true power, or we can look fear right in the eye, keep putting one foot in front of the other, do what is right, good, and tough. When we persevere we therein find part of ourselves and our true character along the way. Perhaps the words from Nelson Mandela’s inaugural speech in 1994 describe the power we possess but many times are afraid to obtain: “Our deepest fear is not that we are inadequate. Our deepest fear is that we are powerful beyond measure……….There’s nothing enlightening about shrinking so that other people won’t feel insecure around you. We are born to make manifest the glory of God that is within us. It’s not just in some of us, it’s in everyone. And as we let our own light shine, we unconsciously give other people permission to do the same. As we are liberated from our own fear, our presence automatically liberates others.” When we conquer our fears we not only become what we can become, we also give others permission to become what they can become. It’s magical! 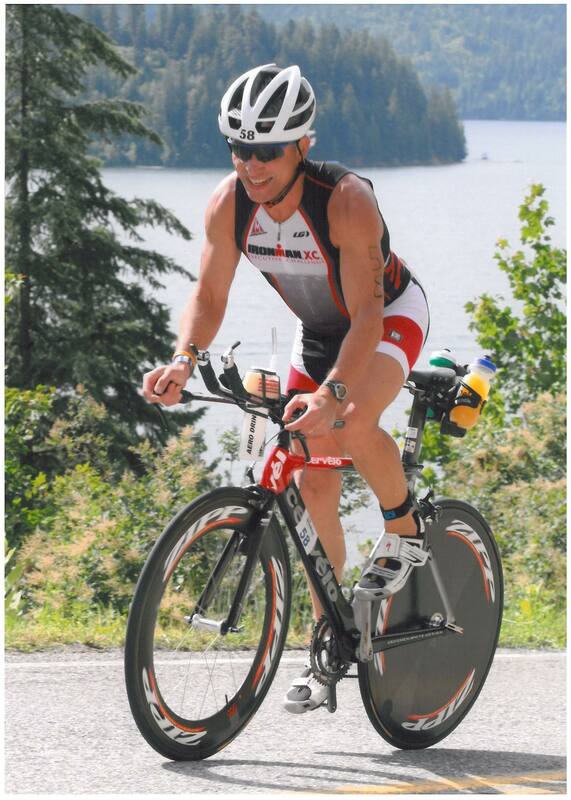 Ironman Canada is such a terrific event partly because Penticton is such a wonderful natural setting. I’ve already boasted about the volunteers. There are also spectators cheering until midnight lining the streets all over the course. In addition there is magnificent scenery. This part of Canada, which includes the only Canadian desert, is really quite different from what many might expect. The swim starts the day at dawn at the beach on gorgeous Lake Okanagan with crystal clear and refreshingly cool water. The bike course passes beautiful vineyards, many wineries, and orchards on the way and through the spectacular mountains. The mountains, including a seven mile climb up Richter Pass, include colorful rock walls, valleys, and a canyon. Whenever you put wonderful, kind, loving people amidst the backdrop of the mountains and lakes, you are just about as close to heaven as you can get. The experience becomes spiritual! What a day! We get to do three of our favorite things – swim, bike, and run – all day (!) with people handing us food and drink. Along the way we get to really experience unconditional love, explore our inner selves, and experience the wonders of nature. Not a bad way to spend a day! 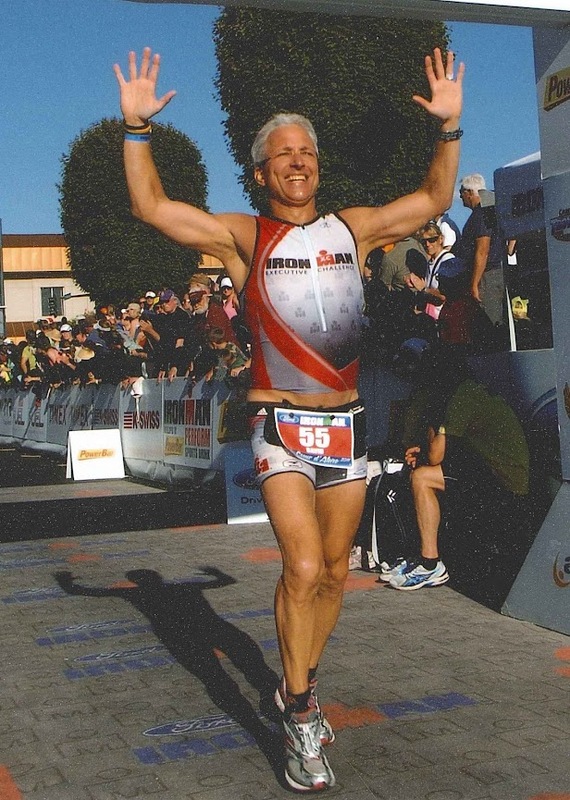 Ed Note: David Daggett is a Winston-Salem Attorney, husband, and father of two young daughters, who at age 42 completed Ironman Canada on August 25, 2002 in 10 hours 51 minutes – and with a smile on his face. Good to hear the 13 plan works! Here’s the plan as of now…build slowly from now until Spring. Currently I do a regular ride on Saturdays of about 50 to 55 miles, the bike is my best, plus running 3 to 4 times a week (15 to 20 miles). The swimming has virtually stopped since the 70.3 in June, but I plan to start back this month going at least once a week just to get the feeling back and work on form. I’m signed up for a 1/2 marathon in Oct with continued running and a ride when the weather cooperates (I live in Holland and the Dutch winters are a bit messy). Next year I plan on doing another 1/2 marathon in March, followed by a full marathon (Rotterdam) in April. I would have about a month before the 13 program kicks in and I would continue the swimming build up and riding. The marathon is more of a mental hurdle and I should have plenty of time to recover before the plan begins. Then it’s Ironman Louisville on Aug 29. It would be great to hear your thoughts. Thanks for taking the time. I’ve really enjoyed the site.